According to the study, some 75% of 12-17 year-olds now own cell phones. And those phones have become indispensable among teens when communicating with their friends. 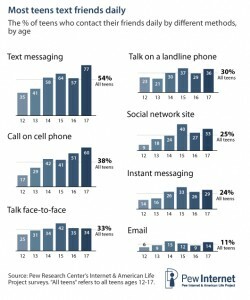 Around 72% of American teens engaged in text messaging. Even more interesting is the fact that more than half or 54% to be exact of American teens are daily texters. In fact, texting has overtaken other forms of interaction and communication among American teens today. 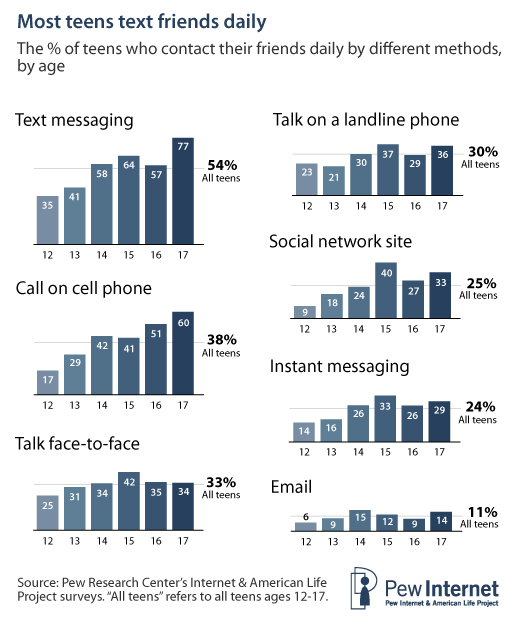 Calling is still a central function of the cell phone for teens and for many teens, voice is the primary mode of conversing with parents. For parents, teens’ attachment to their phones is an area of conflict and regulation. Cell phones are seen as a mixed blessing. Parents and teens say phones make their lives safer and more convenient. Yet both also cite new tensions connected to cell phone use. So there. Now you know what your kids are up to in case they use their mobile phones more often than you’ve expected.